I am always looking for interesting ways to co-opt technology to do things it wasn't intended to do. @joe_sisco has done just that with Google Drawings. Some of you may have word walls in your math classrooms and Joe has, for many years, developed more enhanced word walls that usually incorporate images related to that particular topic. Now he has converted those word walls to Google Drawings and is using an interesting feature that allows you to place things outside of the drawing but still visible. So if you look at the image below, the centre part represents the actual word wall and if you were to print it out, that is what you would see. But the interactive part comes from students who drag the numbered circles from the right onto the wall to indicate where those items are (the numbers correspond to the words). A finished student example is seen on the right. So if students open this in Google Drawings they see the interactive image below and then if they print it out they would see the image to the right. The entire collection (there are over 20 so far) is shared at the link below, you can open any one and print out the word wall portion (or save it as a PDF) or you can copy any one to your own Google Drive and start the interaction. Also if you are into it, there is a template to create your own. And you might want to start with the "How to Use this Folder" file for a more detailed view of the instructions. 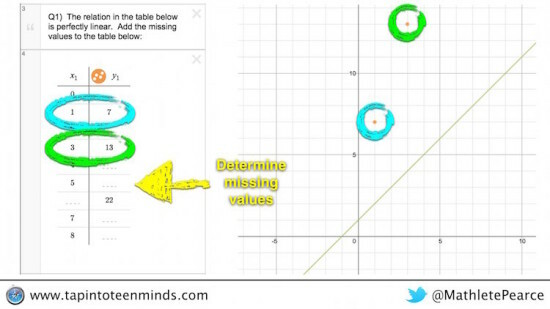 We have two new activities on our Engaging Math blog. The first is a simple matching activity with cards. Students are put in groups and given a set of cards (there are four different sets) and then they have to match the word sentence with the expression. This is not meant to be an activity that takes very long but simply eases students into a comfort level with algebra. I like this activity by Kyle at Tap Into Teen Minds. It adds to the rash of great activities that use a series of Desmos graphs to walk through a concept. In this case it's the idea of the connection between graphs and tables of values with linear functions. It starts with this graph with equations and then moves through several others. One thing I really like is the idea of trying to fill in values in a table and then seeing right away that the points are linear. Take a look a the full description at the link below. I like this as an introduction to logarithms. 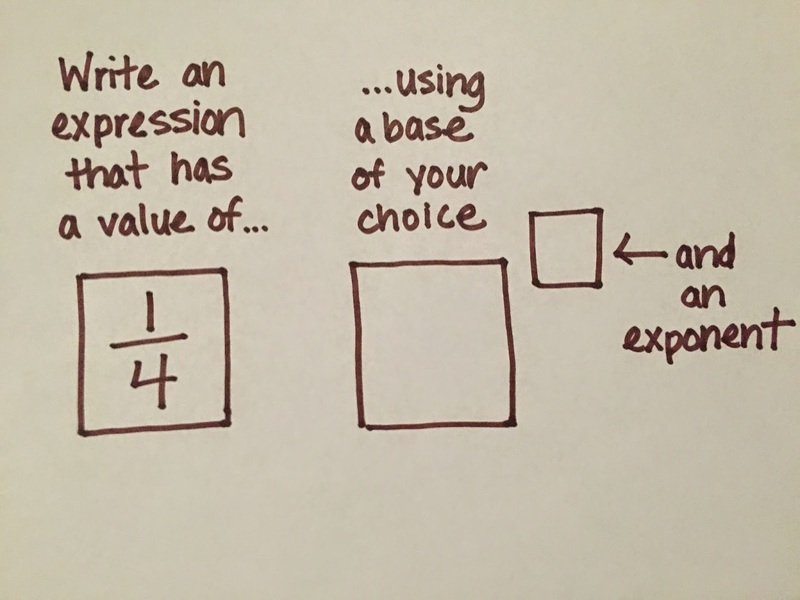 That is, it is a way to solve exponential equations (at least simple ones) by first getting students comfortable with the idea of what the solution means. And doing this with a puzzle type atmosphere. In grade 12 data management it seems reasonable to talk about random controlled trials and why they are so important for research (especially medical research). With that being said, this recent Freakonomics Radio podcast is about that very thing. Certainly worth a listen, if only to gain insight we can pass on to our students. Personally, it's the kind of thing I would have students listen to and then have the discussion afterwards. And one more from Tap Into Teen Minds. These two are on how to use Explain Everything to have students investigate angle relationships. I like the idea of using the protractor and visually comparing the size of the angles by just colouring them in. See how it works with the video below. I stumbled upon this "fan" site for the Roll up the Rim to Win contest. 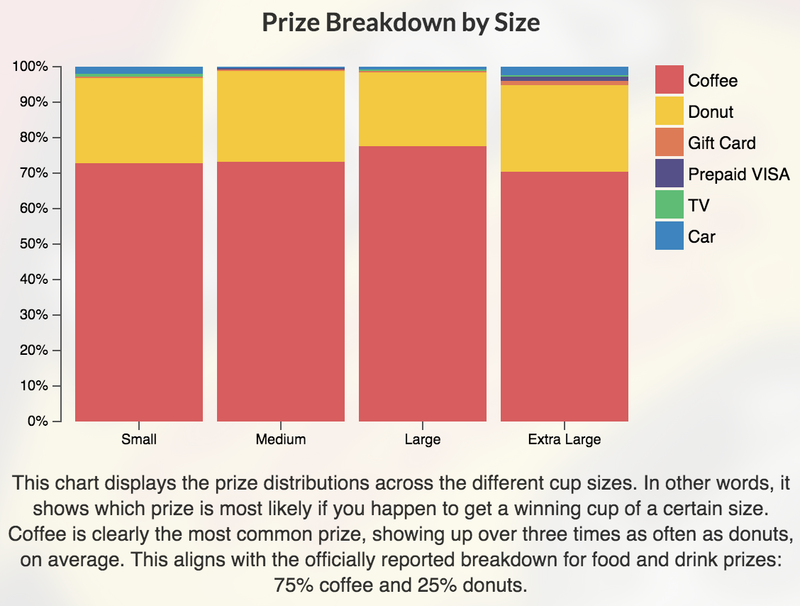 There is a lot of controversy about the distribution of prizes amongst provinces as well as whether it is more advantageous to purchase larger sized cups (because they win more often). So this site allows you to enter your own data and so far they have collected over 14,000 data entries. Then they give you all sorts of graphical analysis of the data. At the very least you could use it to have a discussion on why this data might be biased.